The largest of Bryce Canyon National Park's 20 amphitheaters, the Bryce Amphitheater, makes you feel like you are walking on the edge of another world. 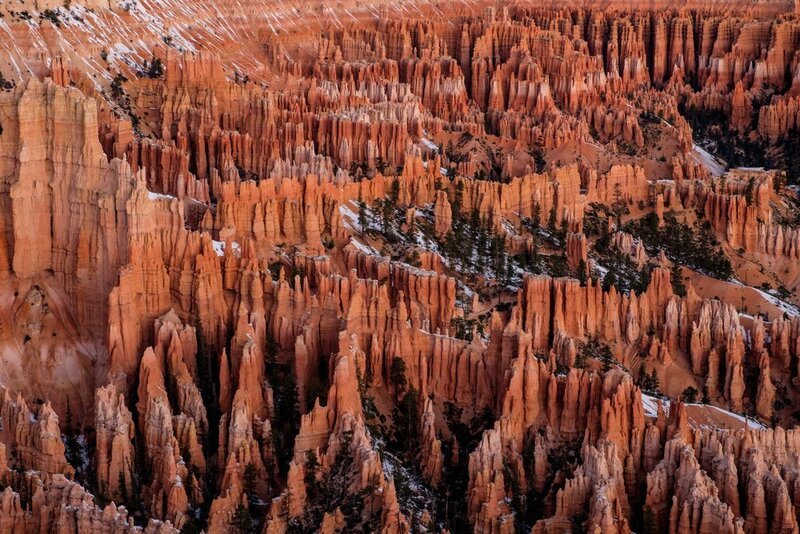 Like many of America’s national parks, Utah's Bryce Canyon National Park has many cool pockets to explore. 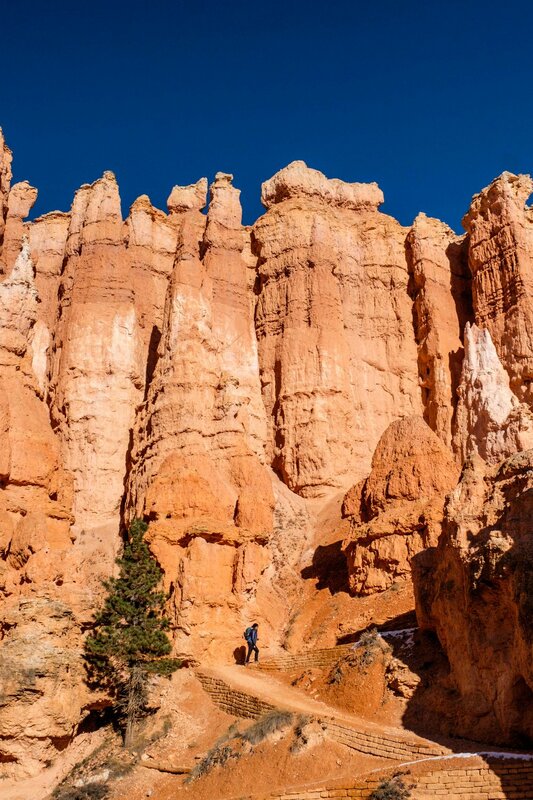 Nothing compares, though, to the feeling you get when standing before the hoodoos that make up the Bryce Amphitheater. 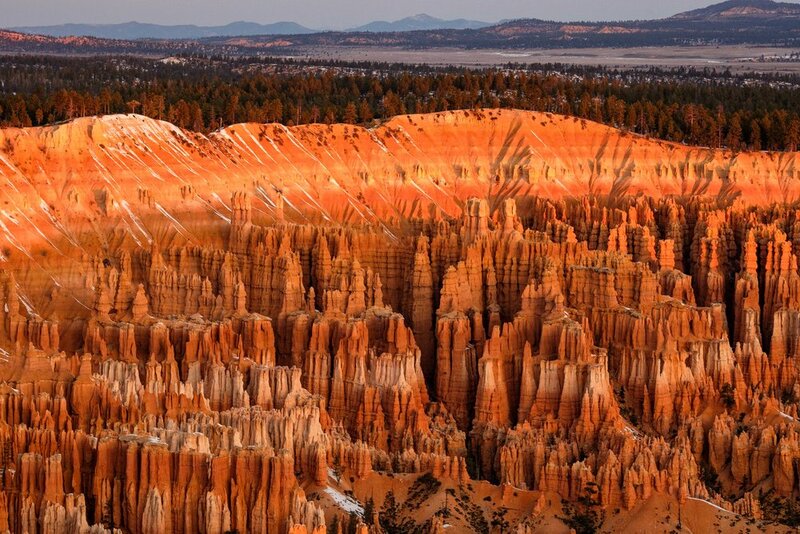 Bryce Canyon is home to the largest collection of hoodoos on Earth. It is not a canyon at all, actually, but a 6-square-mile field of intricately carved statues that were crafted over the course of millions of years by the forces of erosion. 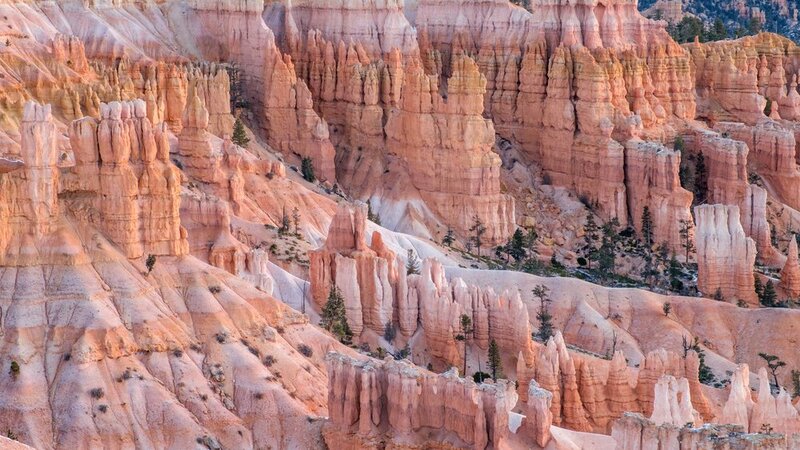 Facing east and south, vast labyrinths of high promontories, deep canyons, jagged spires of balancing rocks, and other mysterious formations are emblazoned by bold colors of red, orange, pink, and white. It is a landscape that is totally unique – entirely different than nearby Zion as well as other Utah national parks – partly attributed to its high elevation location ranging from 8,000-9,000 feet. The air is thinner up there, the environment colder, and the wind much, much stronger – elements that come together to create an otherworld on the edge of the Paunsaugunt Plateau. Stepping onto any lookout, you are challenged to connect with a most amazing example of the forces of nature affecting this planet, and at the same time, you will almost certainly feel as though you are stepping foot onto the edge of another world. 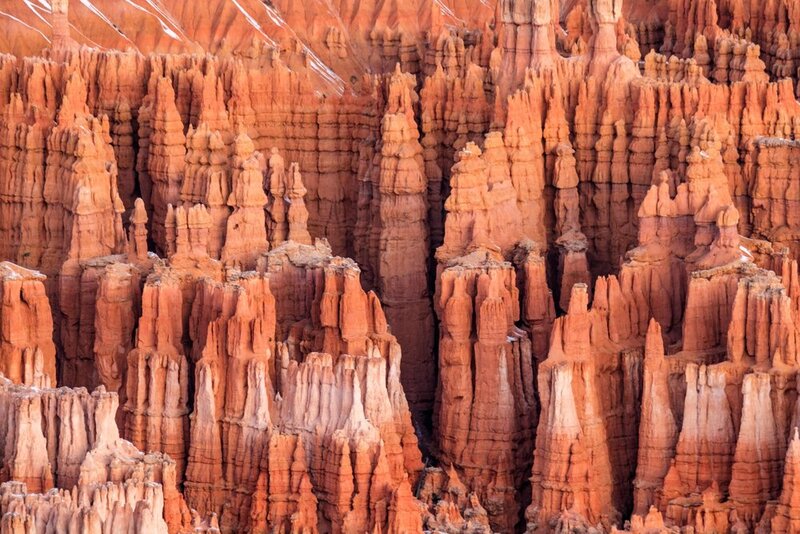 For this article, we want to highlight a few different ideas that will deliver a diverse experience in Bryce – where to stay, hike, auto-tour and capture the best sunrise and sunset views – with the caveat that at this one-of-a-kind national park, there is nothing more spectacular than the red rock nation that sprawls across Utah’s high desert on the Colorado Plateau. Driving into the park from the Dixie National Forest. Drive: Hitting the scenic auto-trails in the national parks is often the best place to start to gain an understanding of the lay of the land. Many of the park roads were developed and built by the Civilian Conservation Corps in the early days of the park service in an effort to provide access to the most interesting (and marketable) features nearby. 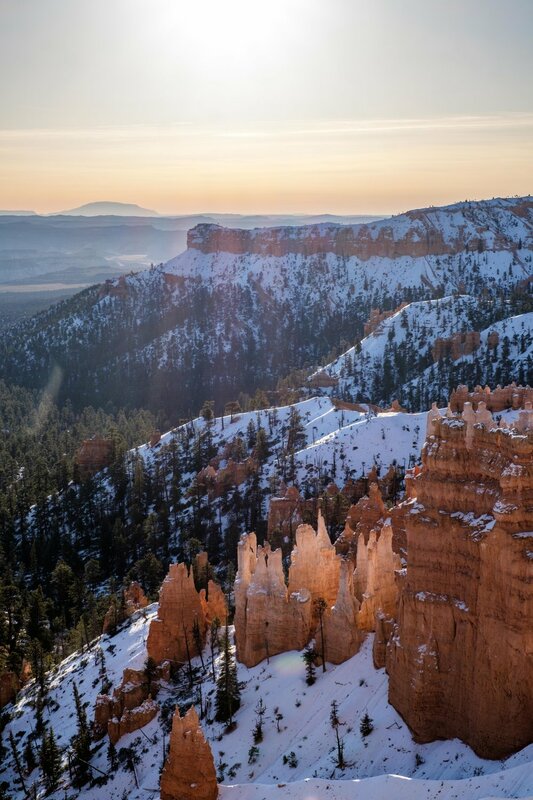 A scenic tour along the 38-mile (round trip) Bryce Canyon National Park Rim Road provides access to 13 viewpoints that peer over the amphitheaters. It is a perfect first outing to get acquainted with the park. Stay: There are three lodging options located inside of the park: the North Campground (open year-round,) Sunset Campground (high season,) and the recently renovated 114-room Bryce Canyon Lodge, which was built from local timber and stone in 1924-25. Any non-park related activity – be it sleeping, eating, shopping, gassing up, or learning about the local history – will almost surely bring you to Ruby's legendary roadhouse. The lodge was built in 1919 by Reuben C. (Ruby) Syrett who was so spellbound by the scene at Bryce that he decided to stand up a “tourist rest” where he and his family could host visitors to the area. As the park became more popular, so did Ruby’s – it is an absolute can’t miss in the area (you couldn't miss it even if you tried!) Everything you need to fuel a park adventure is available there. The operation is still family run – by Ruby’s son Carl, and two generations that follow him. Wander: A 1-mile walk between Sunset Point and Sunrise Point offers panoramic views of the amphitheater and is suitable for anyone, the only real challenge being that severe weather can cause the paved pathway to ice over during colder months. 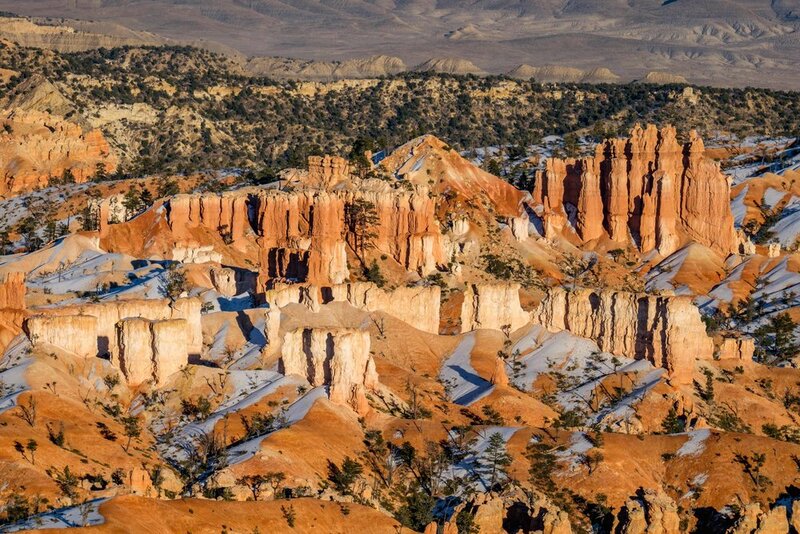 Each overlook is situated at a trailhead where from you can descend into the hoodoos if you want to explore deeper. A classic scene of the Bryce Amphitheater viewed along a walk between Sunrise and Inspiration Point. 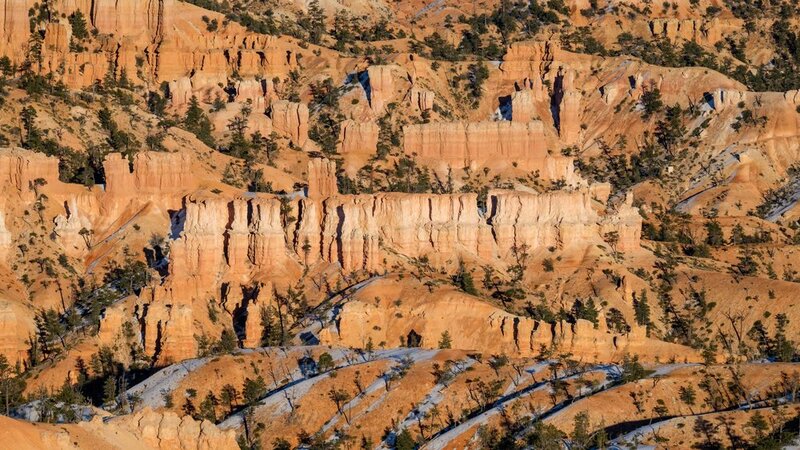 Hike: Standing inside of the amphitheater – even if walking just a short distance into the hoodoos – allows you to become a part of the landscape. 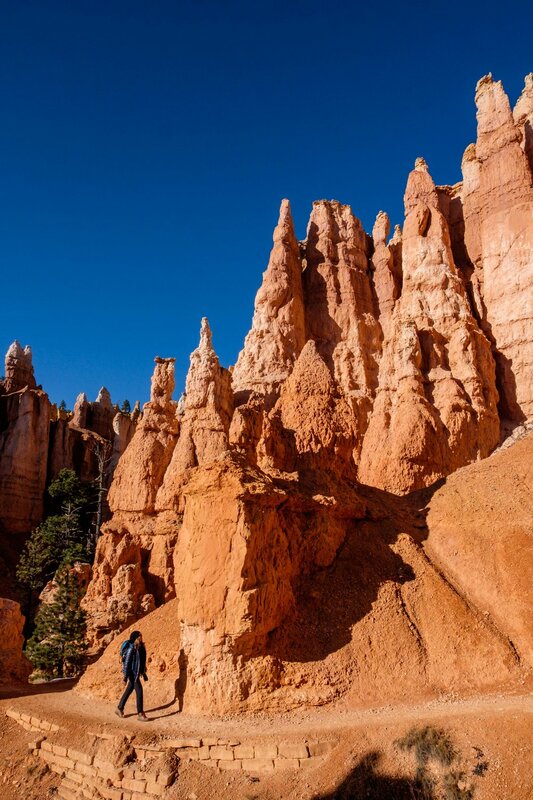 The Navajo Loop trail is the park’s most popular hiking trail because of its accessibility and its beauty. Descending first into the Wall Street section, you are thrust upon an iconic scene in the park, a 700-year-old Douglas fir tree that rises in the midst of a slot canyon to search for sunlight in the sky. Traveling farther, you will find a vast network of trails leading into the hoodoos where you can chart your own course. Descending the Navajo Loop trail from Sunset Point. View: An easy stop off of the Bryce Canyon Road brings you to the Natural Bridge, one of several natural arch formations found in the national park. Deeply colored Ponderosa pine trees can be seen peeking out from behind red rock with vista views as a backdrop. 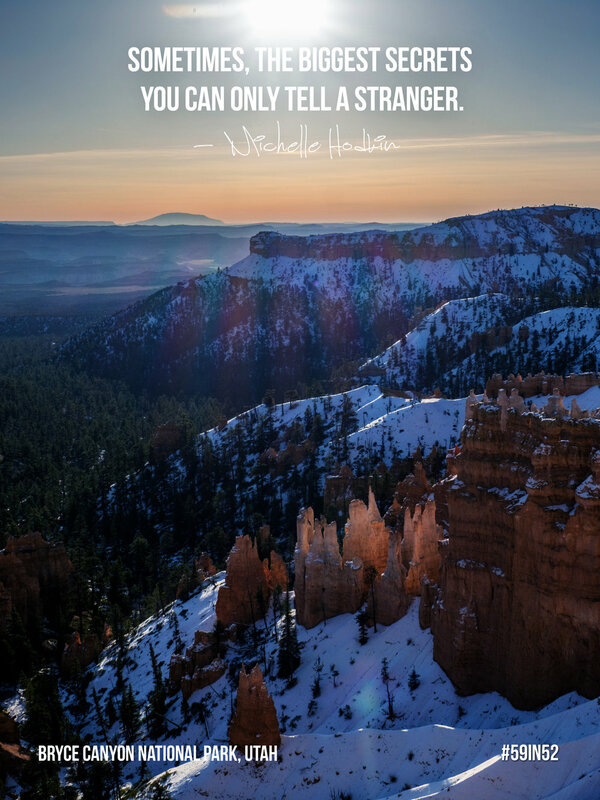 The photogenic scene is a must for every photographer visiting Bryce. The Natural Bridge as seen from a lookout on Bryce Canyon Rim Drive. Enjoy the sunset: Sunset Point is usually the first stop on everyone’s list and is a top spot to capture shots of a golden forest of stone. There is no shortage of onlookers capturing selfies and panoramic shots of the amphitheater at this lookout, but you'll likely find yourself distracted only by the geologic wonder surrounding the scene. This area is called the Claron Formation, made up of deposits from the Claron lakebed comprised of 50-million-year-old limestone that shows rich and vibrant color – especially under the sun – created by its iron oxide mineral compounds. 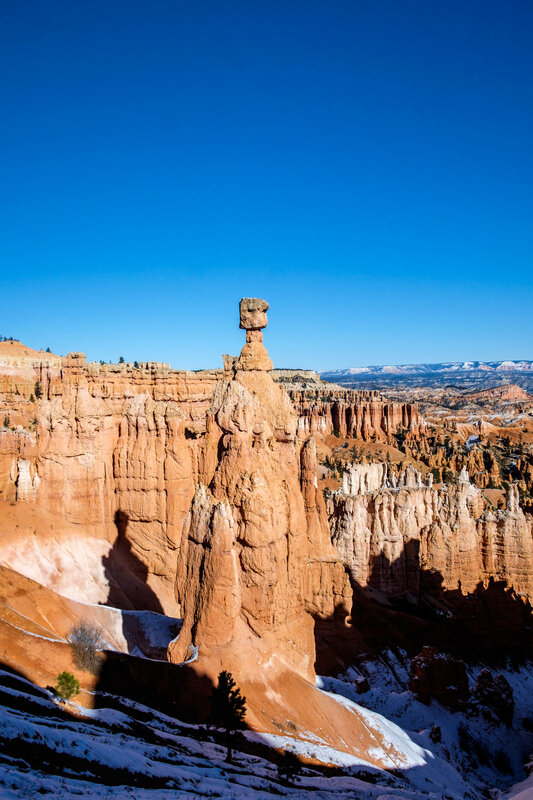 Whether you are intrigued by geologic processes or just want to marvel at the area's undeniable beauty, all visitors stop in their tracks at this famed overlook, particularly when the sun falls onto the canyons. The hoodoos as seen from Sunset Point under the glow of the falling sun. Capture the sunrise: Bryce Point, facing Sunset Point and just a short drive away, is a truly awesome place to catch the sunrise. The sheer drop on the other side of the chain link fence can be a punch to the gut for those whom fear exposure. The air is thin with altitude, and the wind gusts are extra bone-chilling during the sunrise hours… and the skyline, electrifying. This spot is perfect for photographers as well as those who want to see incredible, extreme landscapes change with the light of the rising sun. Another popular place to watch the sunrise is the aptly named Sunrise Point. Sunrise perfection seen at Bryce Point. See something different: Mossy Cave is located on State Route 12 northwest of the small town of Tropic, a neat place to stop and wander during high-season when shops and sites are open. The cave itself can be reached taking the left fork on the Mossy Cave trail. When the conditions are optimal, water drip from the cave ceiling creates hanging gardens (during North American Summer) and icicles (North American winter.) It’s a challenge to photograph because the cave and surrounding area is dark, though the setting away from the crowds of the amphitheater are charming and peaceful. Heading to Mossy Cave in a lesser traveled area of the park. Hug some trees: The forested areas surrounding the national park cross three “life zones” that change with variant elevation gains. In the lower regions you will find dwarf forests (juniper, pinyon pine, manzanita, aspen, willow, and birch) growing along streams. In the mid-elevations, Ponderosa pine, spruce, and Douglas fir forests thrive. On the high plateau, spruce, aspen, and Douglas and white fir continue. At Rainbow Point located at the end of the scenic drive, you can spot the toughest tree on Earth: the ancient Great Basin bristlecone pine, a species categorized among the oldest living organisms on the planet. 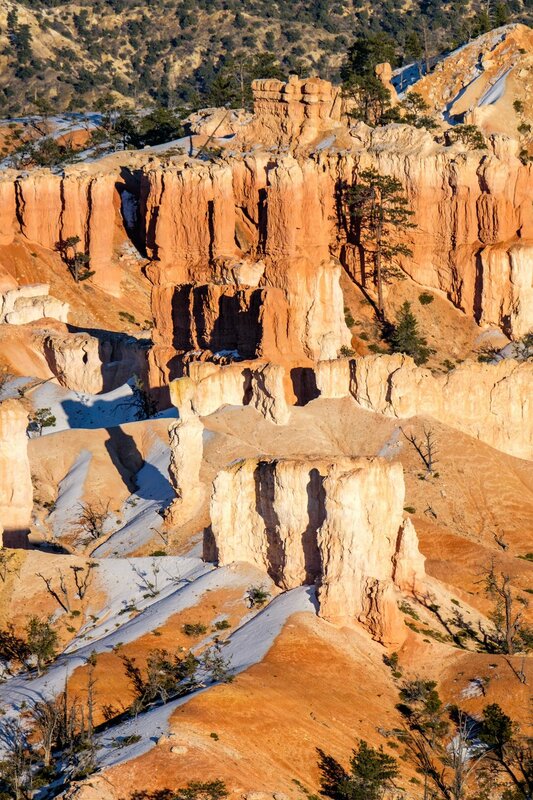 If you look closely, the hoodoos disappear to reveal many species of trees in this high-desert national park! As always, be safe, have fun, and enjoy! Iconic site in the park: There is no view more classic in this park than a sunset view from Sunset Point. It is located just one-mile beyond the National Park Visitor Center, and access to the overlook is just footsteps from the parking lot. If you look just below and to the left, you will find one another iconic landmark in the park: Thor’s Hammer – famed for its unique balanced rock and isolationist position among the larger network of hoodoos that surround it. This area is also stellar for birdwatching (shout out to our bird-ninja friends)! Swallows, Clark’s Nutcrackers, Stellar Jays, hawks and Ravens all soar in the skies, catching air from the thermal cliff sides. 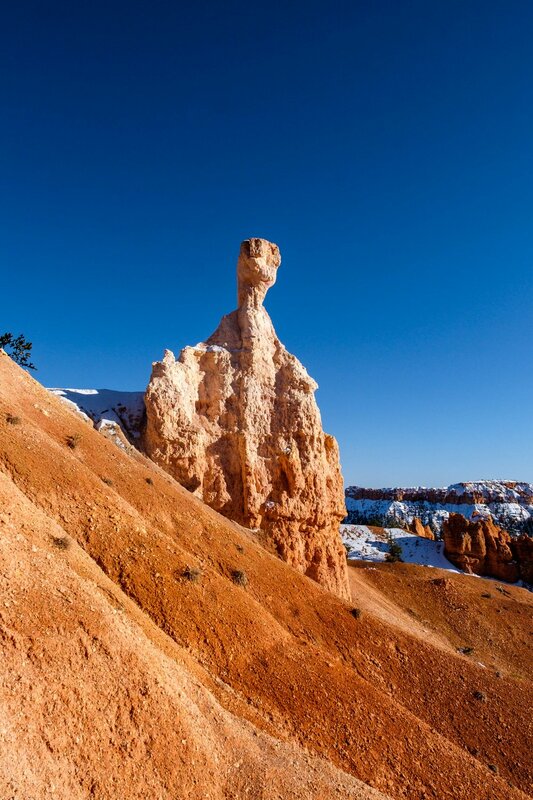 Thor's Hammer stands isolated from other hoodoos in the Bryce Amphitheater. 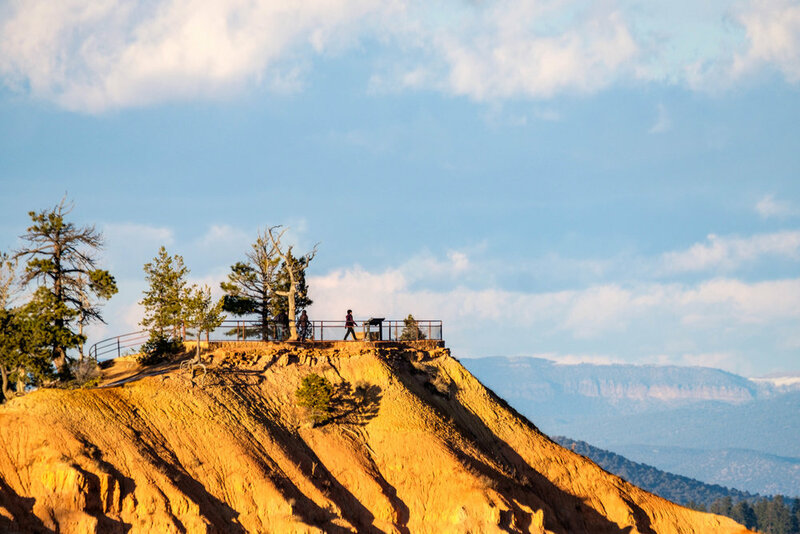 Accessible adventure: Wandering the Rim Trail from Sunrise Point to Sunset Point travels across 1-mile of flat trail hugging the amphitheater where gorgeous, sprawling views abound! 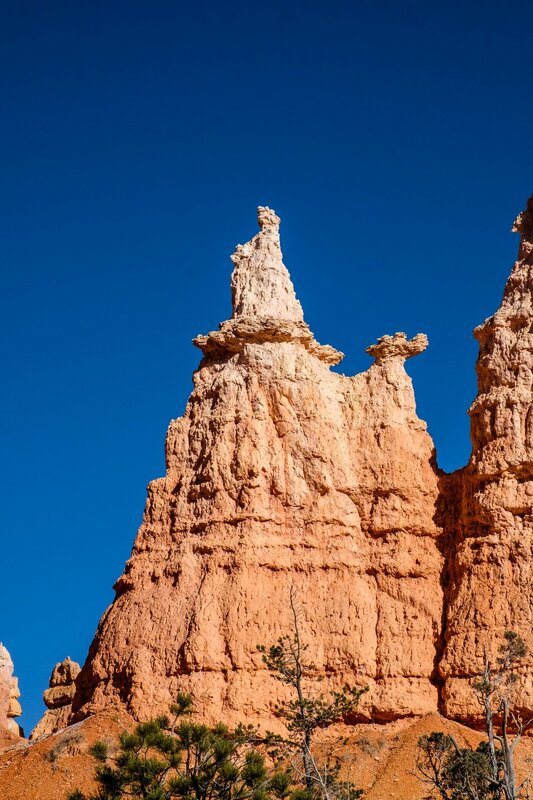 With a large parking lot, restroom facilities and a paved pathway leading to and fro, this is a great spot for people of all ages and with all levels of overall health to enjoy the storied views of Bryce Canyon. 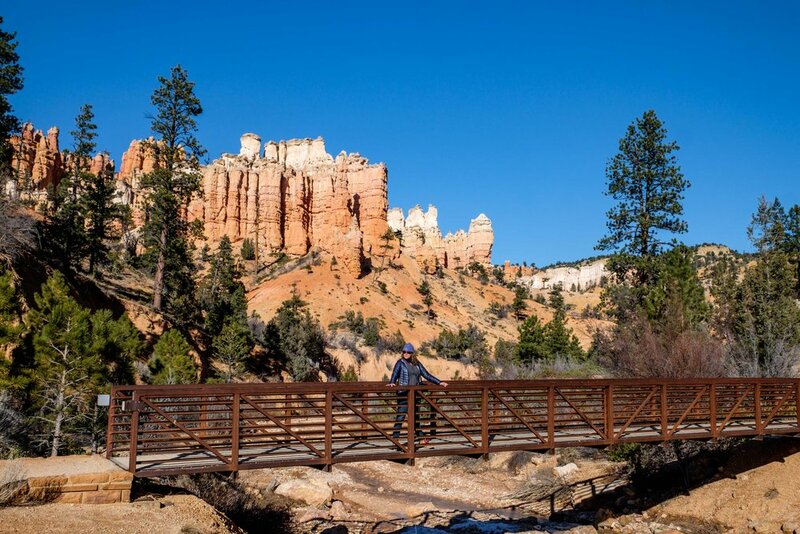 The Rim Trail extends 5.5-miles in total between Bryce Point to Fairyland and has occasional steep elevation changes. Big adventure: Hiking through the hoodoos along the Navajo Loop Trail to the Queens Garden Trail allows hikers to choose their own adventure along intersecting networks that weave throughout more challenging sections of the inner canyons, but with easy access to trailheads at both Sunset and Inspiration Points. This is a moderate outing at just under 3 miles. 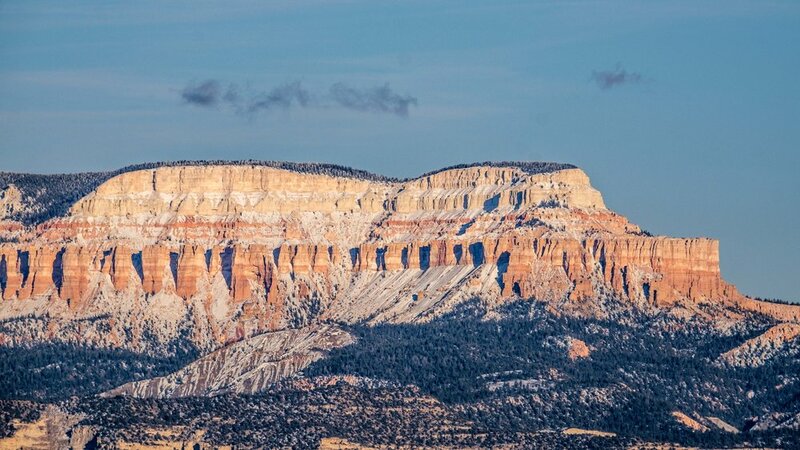 For those looking to go bigger, the Peekaboo Trail (5.5 miles) and Under-The-Rim Trail near Rainbow Point (22 miles) leads trekkers farther into the backcountry. As always, get backcountry guidance at the National Park Visitor Center! 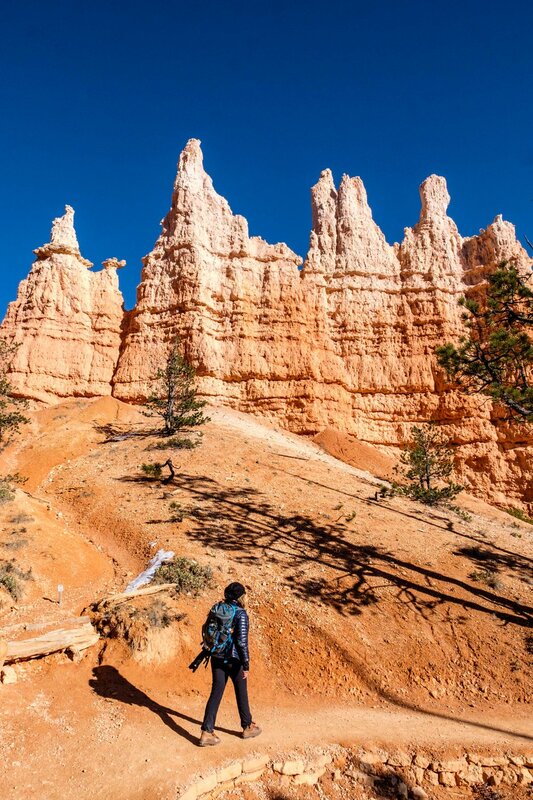 There is a vast network of trails to explore via the Navajo Loop trail. 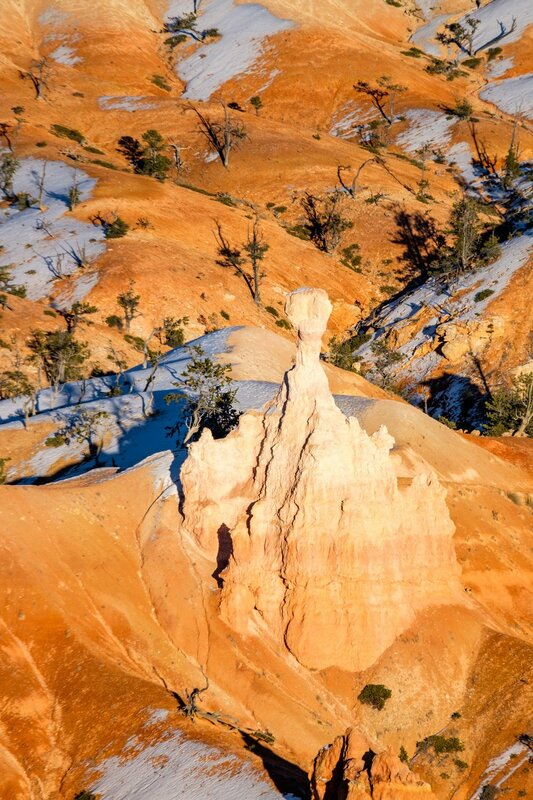 All hoodoos are capped with a top layer of protective rock "cap rock"; the sandstone area beneath it is subject to the endless and ongoing effects of erosion. 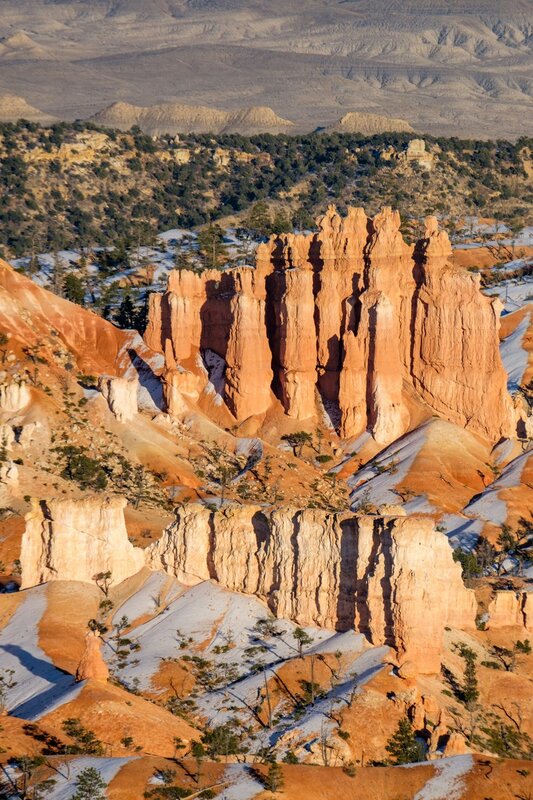 The youngest geologic formations found on the Colorado Plateau, dating back just 65 million years, are found in Bryce Canyon. 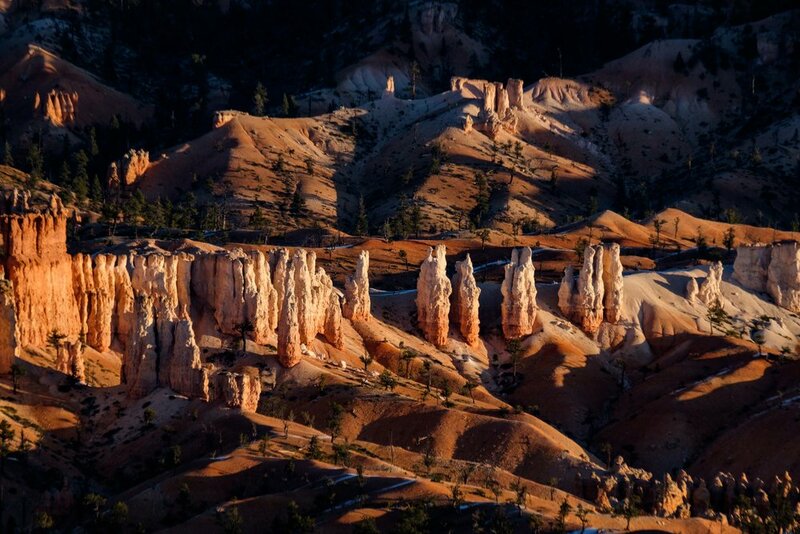 Hoodoos are jagged pillars of rock that have withstood centuries of erosion caused by water, ice, and gravity. 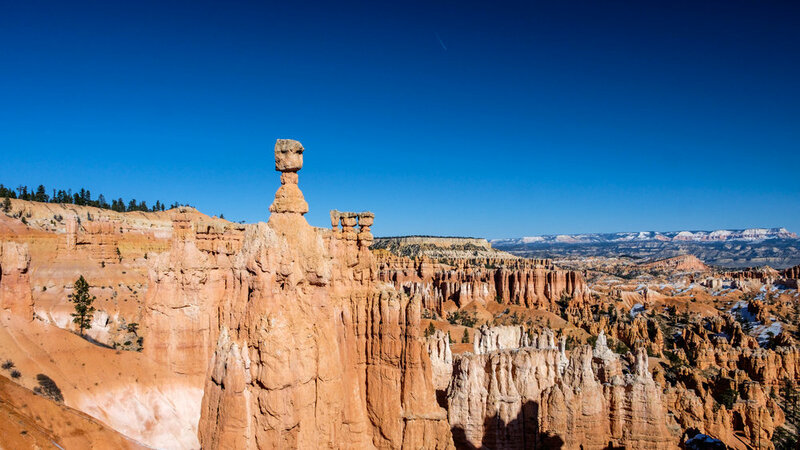 Hoodoos can be found on every continent, though Bryce Canyon has the largest concentration of them of any place in the world. The Bryce Amphitheater is 12 miles long, 3 miles wide and 800 feet deep. 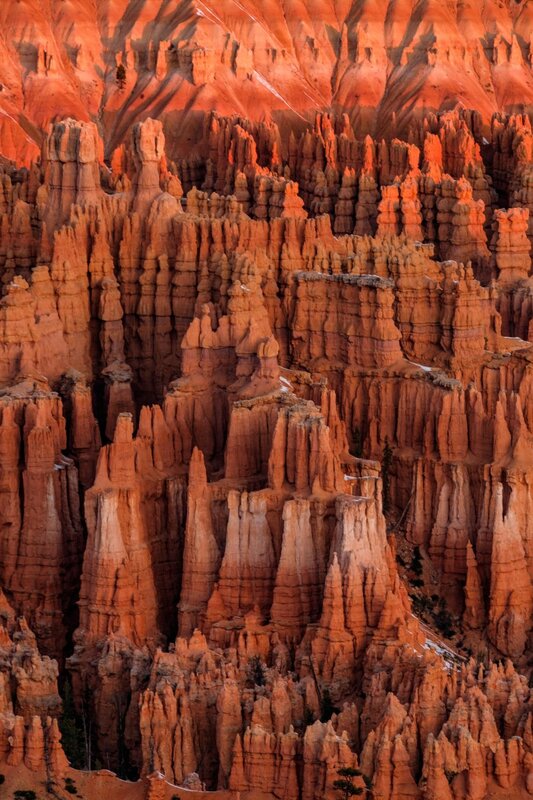 Bryce is located 50 miles from Zion National Park – about 1.5-2 hours driving through the Dixie National Forest. 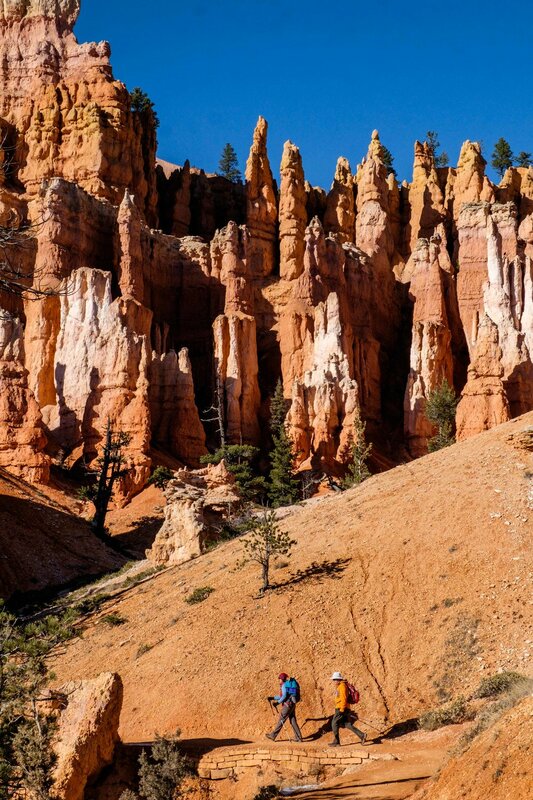 The elevation at Bryce Canyon National Park lies approximately between 8,000-9,000 feet. The highest elevation in the park (9,105 feet) can be found at Yovimpa and Rainbow Point, located at the end of the 18-mile scenic park drive (Hwy 63). 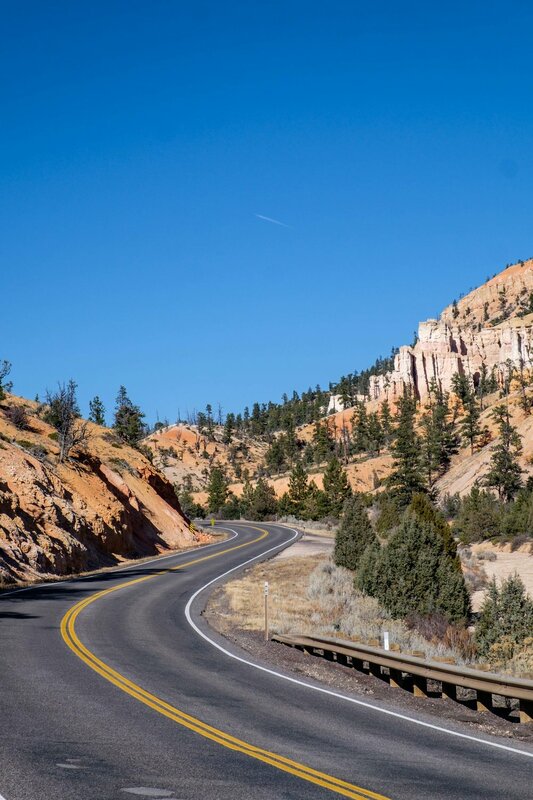 State Route 63 was the first road in Bryce Canyon and was built in 1923 to provide park access to visitors traveling in on the Union Pacific Railroad. During the Great Depression, the Civilian Conservation Corps (CCC) built campgrounds, roads, trails, and established buildings for the U.S. National Park Service. 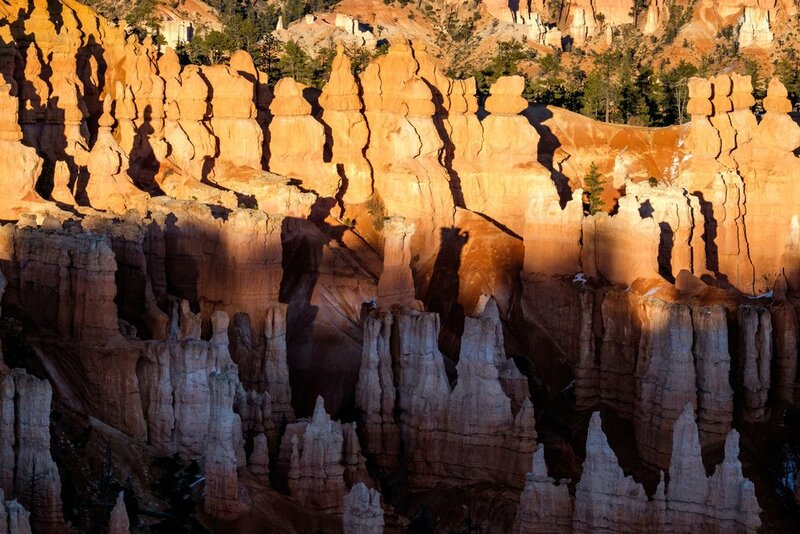 Among their contributions in this national park is Bryce Canyon Road, the main thoroughfare in the park. Dustings of snow atop the landscape is not an uncommon sight at this high elevation park. Bryce experiences 200 days of below-freezing temperatures each year. The park has 8 maintained hiking trails. There are two additional backcountry trails – Riggs Spring Loop, 9 miles, and Under-The-Rim-Trail, 23 miles. Don’t forget your backcountry wilderness permit! Backpackers take note: there are few water sources in the park. Equines can hit the trails in Bryce from April through October. Backcountry skiing is a popular activity during shoulder season. 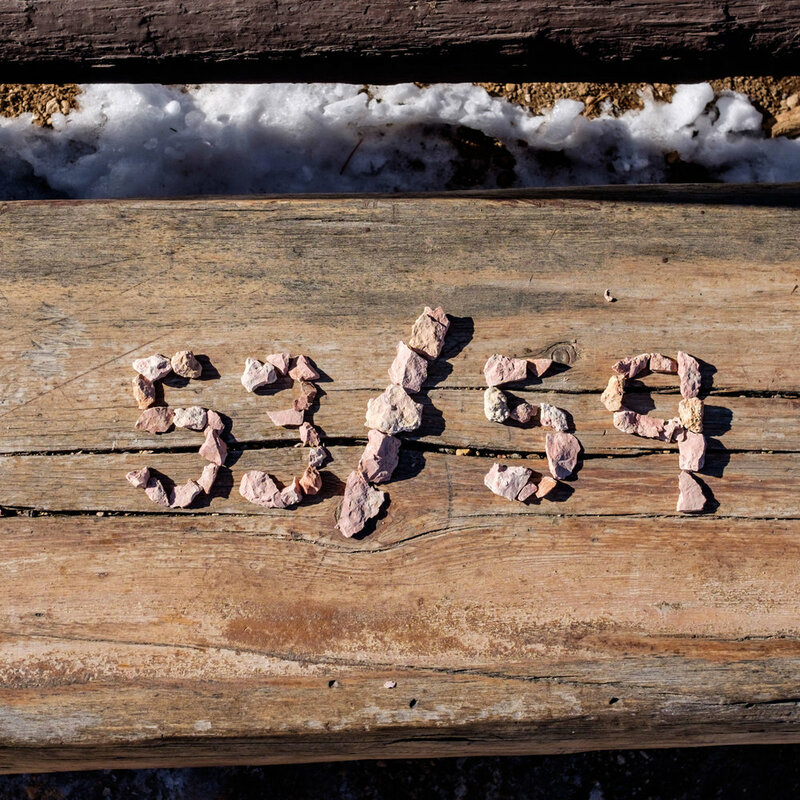 In the nearby Dixie National Forest, there are 20 miles of manicured ski trails. Bryce has one of the darkest skies of all of the national parks in the contiguous U.S. It has a 7.4 magnitude rating, with 7,500 stars visible to the naked eye on any given night. To put that in context, in most places in the lower 48, about 2,000 stars are visible. Each June, the national park hosts the Bryce Canyon Astronomy Festival. Asteroid Bryce Canyon 49272, named after the national park, was discovered at the Goodricke-Pigott Observatory in Tucson, Arizona in 1998. Check out Bryce’s Astronomy & Night Sky programs to see what kind of star stuff is teed up during your visit. On clear days, natural landmarks can be seen in Arizona and New Mexico more than 150 miles away. Bristlecone Pine trees can be seen in Bryce at Rainbow Point. Some are more than 1,700 years old. To see the oldest Bristlecone Pines – the oldest living organism on the planet according to most – head to Great Basin National Park in eastern Nevada and start climbing to the top of Wheeler Peak. There is a naval destroyer named for the park called the USS Bryce Canyon that served as a U.S. Pacific Fleet supply ship for 31 years, ending in 1981. Yovimpa Point provides views of the much talked about Grand Staircase-Escalante National Monument (currently threatened by legislation aiming to open up drilling there); and is also home to the geologic ecosystem that birthed the Vermillion Cliffs – where you can find "The Wave.” The distant horizon shows the Kaibab Plateau, home to epic hiking on the North Rim of Grand Canyon National Park… it’s all connected. A centuries old fir tree rising from inside of the hoodoos in search of sunlight. 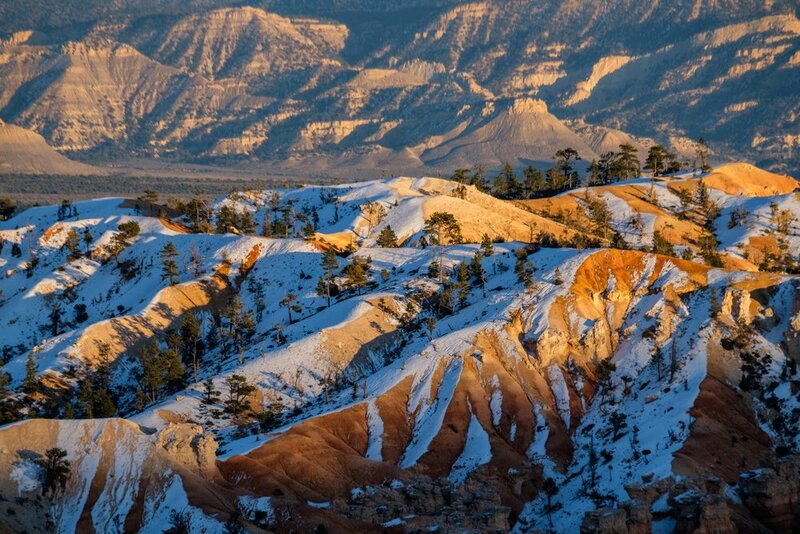 Bryce Canyon has extensive fir forests where diverse wildlife populations thrive. Fox, elk, black bears, deer, coyote, and cougars can all be seen in the park. Most of the larger animal species migrate to lower levels during the cold winter months. More than 170 bird species are recorded in the park each year, including Osprey, Stellar Jays, and Ravens. Ravens are amongst the most intelligent of all birds. They are adaptable problem solvers, and have 33 different call categories based on sound and context. 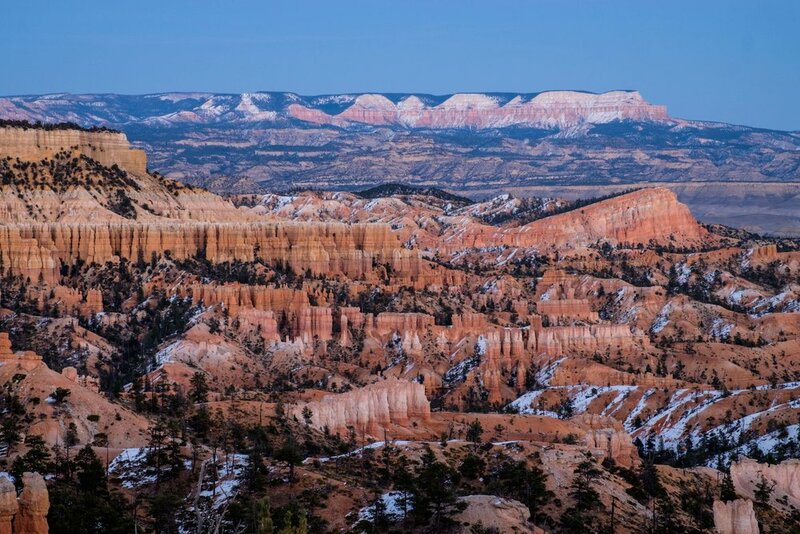 The Bryce Canyon ecosystem is home to three wildlife species listed under the Endangered Species Act: the Utah prairie dog, the California condor, and the southwestern willow flycatcher. Citing the U.S. Fish and Wildlife Service – when Congress passed the Endangered Species Act (ESA) in 1973, it recognized that our rich natural heritage is of “esthetic, ecological, educational, recreational, and scientific value to our Nation and its people.” It further expressed concern that many of our nation’s native plants and animals were in danger of becoming extinct. The National Park Service (NPS) has championed many wildlife species' reintroduction efforts during their tenure, specifically during the last 50 years as the effects of the growth of humanity has taken its toll. In the 1950s, prairie dogs vanished from Bryce and were reintroduced in the 1970s. The effort has proved successful and prairie dogs still live in the area today. Thank you NPS! Human artifacts date back in the area as far as 10,000 years. Ancestral Puebloan (AKA, Anasazi) and Fremont culture artifacts from the mid-12th century have been found in and near Bryce. Both cultures were discussed in our Mesa Verde page, and Capitol Reef page, respectively. 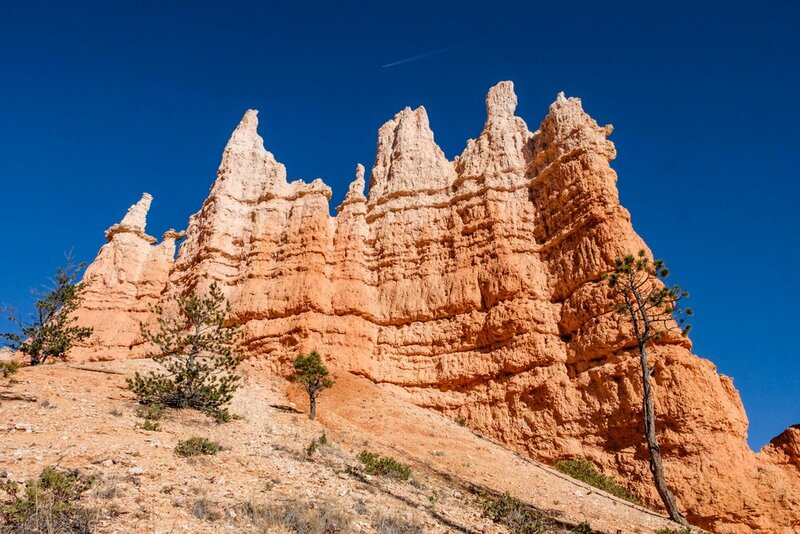 The Paiute Indians thrived in the area that is now Bryce Canyon National Park and in its surrounding region. 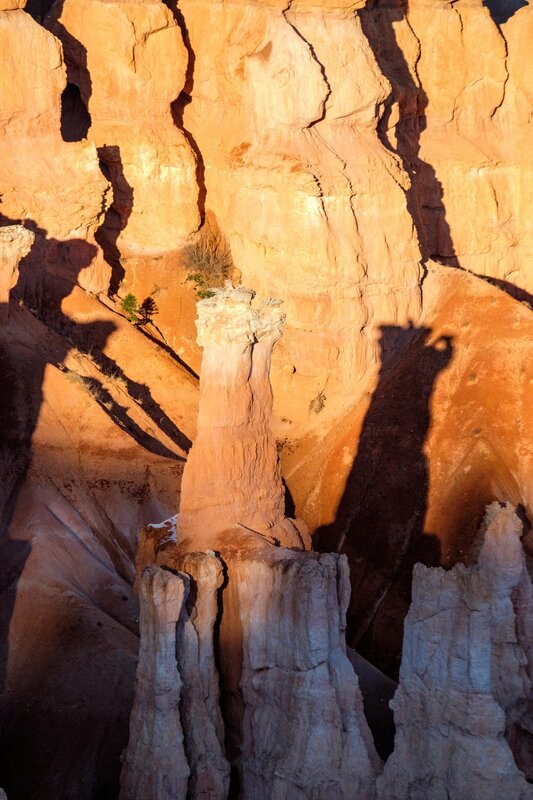 Early geologists in the area had superstitions too… many of them feared the hoodoos would transform into humans. Life many of the national parks in the Four Corners area of Utah, Colorado, Arizona, and New Mexico, native American Indians – in Bryce, it was the Paiute – were driven away due to drought, flooding, and exhaustion of resources. The first major scientific expedition of Bryce occurred in 1872, when U.S. Army Major John Wesley Powell and his team of geologists and cartographers hit the area as part of a much larger study of the Colorado Plateaus. Many of the Paiute names for certain areas were retained by the mapmakers and remain today. Conservationism became a hot button issue in the area around 1923 due to widespread damage in the park from logging, overgrazing, and unregulated visitation that was on a steady rise due to the success of the Union Pacific Railroad which expanded rail service into southwestern Utah, and also due to marketing efforts by rail companies that effectively touted the beauty of the area. 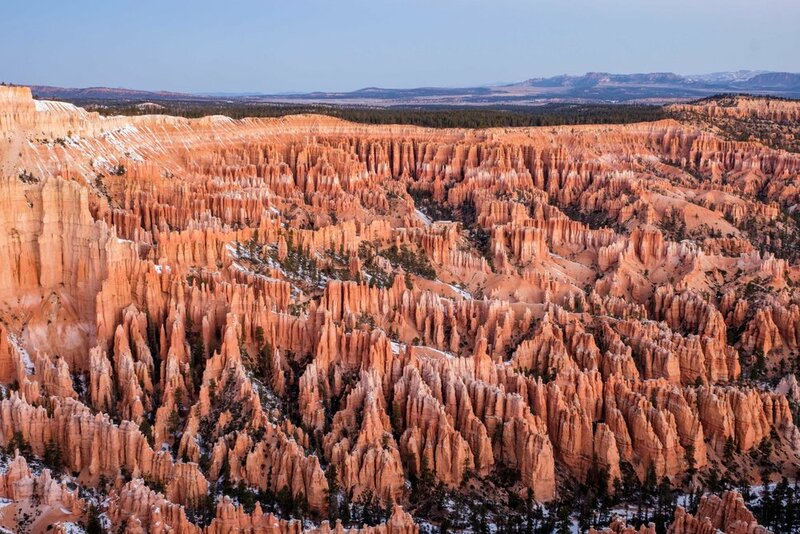 Then National Park Service Director Stephen Mather proposed turning Bryce Canyon into a state park; the Utah governor and State Legislature instead lobbied for federal protection and earned it. In 1923, President Warren G. Harding protected Bryce Canyon as a national monument. In 2016 during the Centennial Anniversary of the U.S. National Park Service, remote Bryce Canyon welcomed approximately 2.4 million viewers, a 35% increase from the year prior. In contrast, Zion saw nearly 4.3 million visitors during 2016 and nearly 6 million people visited Grand Canyon National Park in Arizona. We encourage visitors to take the free shuttles provided by the park service to travel scenic Highway 63, as it eases park congestion while easing visitor frustration – parking spots can be hard to come by at some of the parks busier viewpoints. 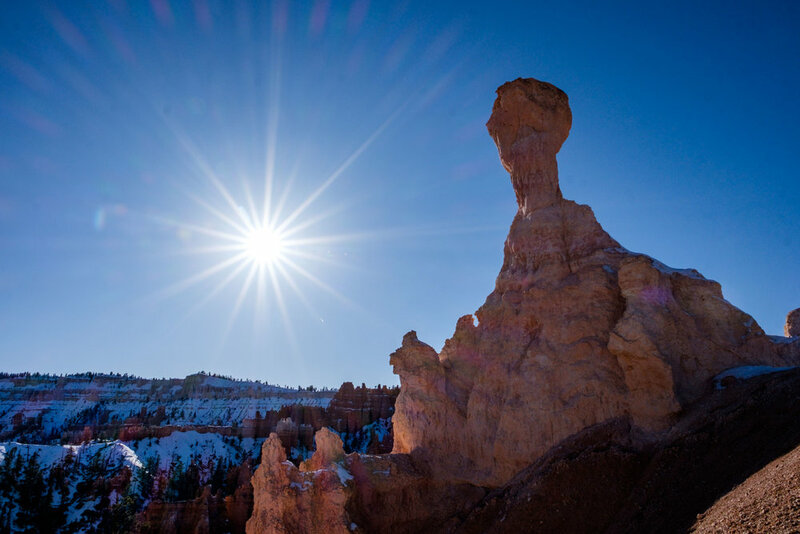 Before you go, check Bryce Canyon’s official website for park alerts. 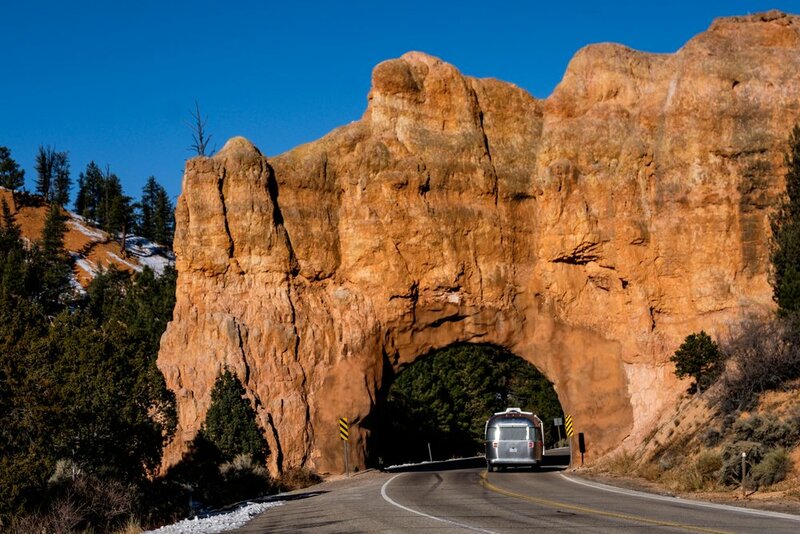 Wally the Airstream makes way through a natural arch in the Dixie National Forest en route to the park.